A nursery rhyme theme baby shower or party with a storybook theme makes the task of finding decorations, designing invitations and on-topic gifts so much fun! Once you choose your favorite rhyme, you will be able to scan the poem for clues on what colors, motifs and decorative products will carry the party in the direction that you want. As an example, if your inspirational rhyme is Little Boy Blue you probably would want to skip pink plates and save your pink shower invitations for another occasion. There are many nursery rhyme baby shower ideas that are gender neutral, but Little Boy blue is not one of them. Go here to see to see many more examples including "Twinkle Twinkle Little Star" and other nursery rhyme baby shower invitations and decorations. There is a list of five or ten children's Nursery Rhymes that would provide excellent inspiration for Mother Goose baby shower themes. If I tried really hard, did some research and pushed the old memory into high gear, I might be able to come up with more and maybe even have the ability to recite a few lines although the wording might not be exactly as they are written in the Mother Goose books. There are actually hundreds of these children's poems that can be called upon to provide the foundation for unique nursery rhyme baby shower ideas for boys, girls or both if you need a baby shower theme for twins. There are numerous rhymes that specifically mention boys and girls, but a large number of the Mother Goose Rhymes are gender neutral. Many mention popular baby items by name that you could turn into the focal point of your party. ABC – Big A, Little A and a Bouncing B. Kitty’s in the cupboard and she can’t see me. Alphabet party and nursery decorations, gifts and some ABC alphabet games and this baby shower is complete! A Tisket A Tasket calls for copious amounts of green and yellow baskets. Nothing says gender neutral like shades of green and yellow. This is an excellent color combination for early spring when the baskets can be filled with tulips, forced bulbs or colorful arrangements with a letter written to the poet’s love mentioned in the rhyme added as a decoration. Consider this theme close to Valentine’s Day and use cards with red hearts to embellish your decorative centerpieces. Bye, Bye Baby Bunting - Father’s gone a hunting – This rhyme would be excellent for a nursery rhyme theme baby shower for dads who like to hunt and fish. One of the most popular, and easy to organize unisex baby showers would be a Baa Baa Black Sheep nursery rhyme theme baby shower. A little lamb baby shower is a classic and there is certainly no shortage of merchandise to inspire baby shower gift ideas. Hey Diddle, Diddle – A shower that will appeal to cat lovers and musical aficionados alike. It is entirely up to you as to whether to showcase the cat, the fiddle or the cow that jumped over the moon. Ding Dong Bell Puss is in the Well or Jack and Jill Went up the Hill both are excellent rhymes for a combination wishing well and Nursery Rhyme theme baby shower. For a rattle shower or a shower for a baby boy or girl whose father is unavoidably absent, you can use the following nursery rhyme wording for your baby shower invitations. "You shall have an apple, You shall have a plum, You shall have a rattle, when your daddy comes home." Baby shower gift ideas can be baby toys, rattles or items decorated with bright, red apples. Humpty Dumpty could be a key player in a nursery rhyme theme baby shower where a medieval atmosphere with castles and the king’s horses and men in attendance are desirable. 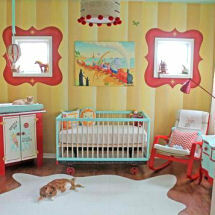 For a nursery rhyme theme baby shower planned near Halloween, the Itsy Bitsy Spider would be perfect. Old Mother Hubbard and her shoe is a good nursery rhyme theme baby shower for a mom who is about to give birth to multiples or twins. There are plenty of rhymes to handle showers for baby boys and girls. My advice is to pick up a book, reacquaint yourself with what is available and use your imagination to create some fun nursery rhyme baby shower games for your guests’ entertainment. 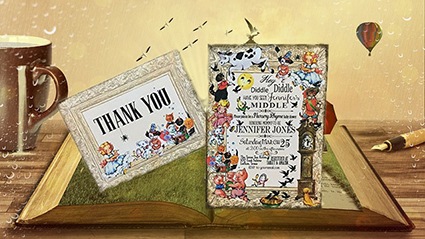 And don’t forget to pick up a beautifully illustrated Mother Goose book to present as a gift to the guest of honor. Return to Unique Baby Gear Ideas for more creative party suggestions.